소득 오르고 삶의 질 높아져 개성있는 집 꾸미기에 관심. 최근 자주 보이는 생활용품 시장에 관한 기사입니다. 이러한 시장 흐름은 아모레퍼시픽 브랜드&디자인 랩이 2013년부터 자사 생활용품 브랜드 (해피바스, 미쟝센, 메디안 등) 디자인 시 고민했던 주제와 다르지 않습니다. 집이 단순히 주거의 의미에서 벗어나 고객의 라이프 스타일이 고스란히 녹아있는 공간으로 전환됨에 따라 집에 두고 사용하는 우리 제품도 다른 관점으로 접근해야 한다고 생각했습니다. 고객이 ‘마트에서 핸드워시를 산다’ 보다는 ‘마트에서 우리집 욕실에 둘 핸드워시를 산다’는 관점으로 접근해 판매공간에서만 어필하는 것이 아니라 내 집에서 보기 편안하고 어떠한 라이프 스타일과도 잘 어울리는 디자인이 해피바스가 추구하는 디자인입니다. 그래서 해피바스 핸드워시는 욕실에서 있는 그대로 사용해도 충분히 아름답습니다. With higher income and quality of life, more people are interested in creatively decorating their home. This is one of the popular articles on the home goods market. This market trend is no different from what Amorepacific Brand & Design Lab contemplated in its redesign of the company’s home goods brands (Happy Bath, Mise-en-scene, Median, etc.) since 2013. As the home is no longer a mere shelter and is becoming a lifestyle space, we thought that our products for the home should be approached from a different perspective. 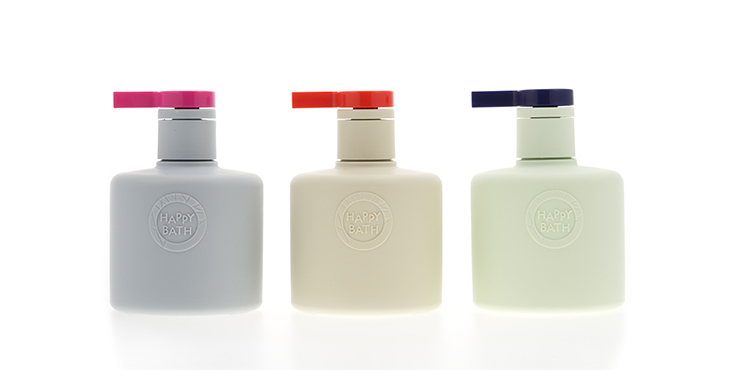 The design pursued by Happy Bath is pleasant to look at and goes well with any lifestyle at home. It was borne from the perspective that customers ‘buy the hand wash at the mart to place it in their bathroom’ rather than simply ‘buying the hand wash at the mart’. That is why Happy Bath Hand Wash comes in a container that is beautiful to use in the bathroom at your home.